I've enjoyed Mike Riddell's The Insatiable Moon blog (see sidebar) for a long time. The whole nine yards—as he calls it—is a fascinating tale that illustrates so much about New Zealand filmmaking as well as about the movie itself. It's a case study from the 'new' and democratised global filmmaking that Development's a part of, too, but much more tightly focussed than this blog. I'd love to read it as a book. Maybe with the DVD? 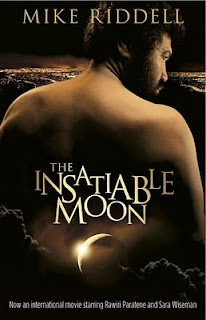 Mike adapted The Insatiable Moon from his own novel. 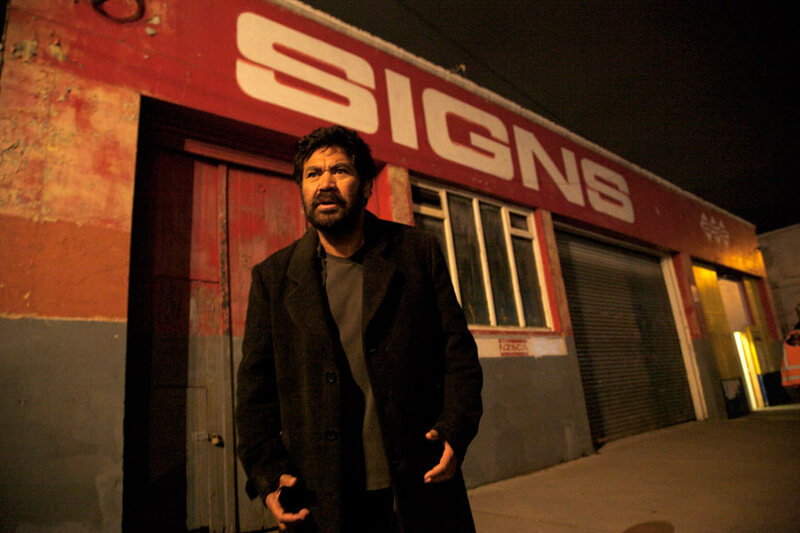 The story of self-proclaimed Second Son of God Arthur (played by Rawiri Paratene from Whale Rider) it will premiere in Auckland on 17 July, as part of the 15-centre New Zealand International Film Festival. It will also be shown in Dunedin. I'm disappointed that it won't come to Wellington with the festival. Because I'm longing to see it and will now have to wait for the general release, and because it seems likely to be a fine companion to Kathy Dudding's essay film, Asylum Pieces. 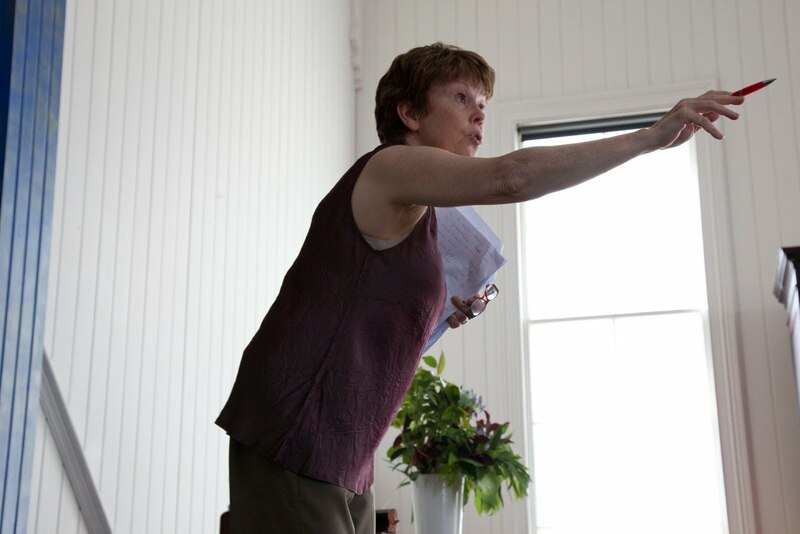 And, because The Insatiable Moon's one of only two New Zealand features in the festival that are women-directed, I was eager to talk with the director, Rosemary Riddell. Here's the promo, where Rosemary talks a little about her role in, and her hopes for, The Insatiable Moon. And here are the questions I emailed to Rosemary and her responses. Q: When you say "I want people to laugh and cry and come out of the theatre feeling joyous about humanity...And I want it to stir something in people" what is the 'something' that you want to stir? Why? A: To stir their hearts about their own spirituality and where that could be headed, to rethink traditional responses to issues in our society especially about those with mental illnesses. Hopefully people will come out of the cinema different than when they went in. Q: The Insatiable Moon has a long backstory, hasn't it? It's based on Mike's experiences in Ponsonby, long ago, which he built on in the novel. And it's had a slightly unusual journey to the big screen, which Mike's recorded so wonderfully in his blog. If you look back at that history, before you became director, what stands out for you? A: What stands out for me is Mike's stickability in the face of so much criticism and scepticism—you can't make a film about psychiatrics, you'll never raise the money, it can't be done. It's such a huge challenge to get the story to the screen. Not only do you have to believe in the project, you have to ride the wave of all those doubters who would have you toss it all in if you listened to them. Q: How did you come to direct The Insatiable Moon? A: Ah well that's a story. We had British director Gillies McKinnon who got nervous when the budget dropped below $1million. He had been committed to the project for a few years and on the strength of his involvement we secured big name actors such as Timothy Spall and others. When Gillies reluctantly walked, we had a very dark week that involved a lot of soul searching. The producers then suggested I direct it based on my previous acting experience and having directed plays and a short film. I was initially terrified and it took our lead actors some convincing I could do the job—that done I knew I had the time for filming as I'd scheduled my leave to be around the set, wander around Ponsonby and generally have a lovely relaxing time. However no time was available before filming for rehearsals so that had to happen in the weekends. But once committed to it, my natural optimism kicked in. Q: You and Mike have worked together before, but in theatre, when you directed Jerusalem, Jerusalem, which appeared at the Edinburgh Festival. How does that work, directing your husband's scripts, which is very unusual? Did you have an input into the script? A: Film is a completely different animal from the stage and I owe a huge debt to the director of photography, Tom Burstyn (This Way of Life), who was so brilliant at capturing the cinematic vision. Always I've had in my head the vision of the film, which I've lived with for many years since I read each chapter of the novel as Mike was writing it. I knew the story had a filmic quality which needed to be seen on the big screen. The script went through a number of changes as Mike responded to various demands from others and I didn't have much input into that. But once we got to the final draft I put my ten cents worth in at times. 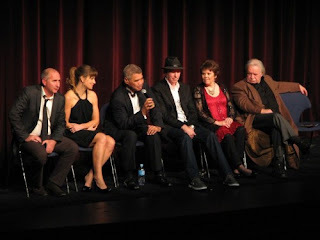 Q: You also directed Cake Tin, written by Bronwyn Tainui, which won Best Short Film at Moondance. I was intrigued when someone asked Taika Waititi "Can a director be an author of a film if he didn't write the screenplay?" and his response was "He can be the publisher." What do you think? What would have been different for you if you'd also written the script? Do you write scripts, or have you considered writing them? A: As I've said above, I've held the story in my head for years. Mike's script conveyed exactly what I meant and the actors brought it to the screen so expertly and with the passion I was hoping for. I think the art of the director is that of the realisateur: the one who brings the script from the imagination to reality. It's not necessary to have written it yourself—only to inhabit the story. In some ways I think there's an advantage to being a sole director rather than a writer/director—it gives you more perspective. But any film is the result of intense creative collaboration—I'm totally opposed to vanity credits by directors. No I haven't written any scripts for film although in years gone by I've written plays—a long time ago. Q: What intrigues you as a storyteller? As a director? As a filmmaker? A: Telling stories that move people—I think film is a medium which has such a power to affect the emotions, to challenge ideas and be a catalyst for change. Q: What audience are you looking for? A: Well officially the film is aimed at the 30-50 age group but we've seen younger people in their twenties respond so well too. We're confident of attracting an international audience, and have already had good reactions from UK test audiences, and the themes are universal. Q: 'Unusual' seems to repeat itself here, but it's also very unusual for a judge to be a filmmaker. How does that work? Are there similarities, differences? And both law and feature film directing are traditionally very male, so what do you think has helped you succeed in both, as a woman? A: Well as you've heard I didn't set out to be a filmmaker (but then I didn't set out to be a judge either)—sometimes the serendipity of life breaks in unexpectedly. Maybe being a judge helped in that I'm used to making decisions—that helped on set at times. Yes both are male dominated professions. I think what has helped me has been equal doses of hard work, luck, and timing. I've never done things in the usual order. For example I didn't graduate as a lawyer till I was 40. But that also gave me life experiences that many of my fellow judges wouldn't have had. Q: What was it like to direct The Insatiable Moon? The promo reinforces my sense from reading the blog, that it was very much a film made from the heart. What were the highlights? The challenges? Were there any gender-related challenges for you? A: You're absolutely right—it was entirely a film from the heart and I think the cast and crew all cottoned on to that early on—they were great. The highlights were working with a cast—many of whom were experienced actors who delivered exactly what I was after. Without a doubt the biggest challenge was all the location work. Noises from traffic (and drivers who hooted their 'support' as they drove past), dealing with businesses in Ponsonby, the weather which often provided four seasons in one day, people watching us filming and looking at the camera instead of the action—big challenges! Gender stuff? Not really, as the director I left it to the producers to fight the fires when problems arose, so they really kept me cocooned from hassles. Q: What happens now, with The Insatiable Moon, and with your own filmmaking? A: Well the film is almost finished. This weekend we're working on the final edit. The film premieres at film festivals with general release later in the year. I have another project (also written by Mike) I'd love to work on. That will have to wait for another long holiday spell. But it's certainly whetted my appetite for filmmaking. A: We've just heard that the film will show at the film festival in Christchurch on 4 and 5 August. It's nearly sold out for the Auckland premiere on Saturday 14 July so word about the film is building nicely. You can book here. And, a new edition of the book will be out in July. And here they are at the NZFF premiere. There were two showings, tears and laughter at the right places, two standing ovations and some serious partying. What a thriiiiiiiiilllllll. After eight years. So lovely to read about such a satisfying outcome. Many congratulations to them all. Hope Insatiable Moon reaches Wellington SOON. 3 October 2010. The story continues, here on Kate Rodger's Reel Late With Kate (TV3). The Insatiable Moon opens this week in Wellywood, and there'll be a gala premiere in London 11 October. Thanks. You're welcome. & yes, I'd like to hear more from Ms Riddell, too! Saw it, loved it. Was expecting mediocre but instantly totally engaged with the film's direction, the characters, the problems, the quirky endings. The sexual relationship between the two main characters seemed unrealistic but we suspended disbelief. Laughed, cried, didn't expect to be so affected. Will "The Hobbit" be crowd funded?